Making delicious and flavorful food has never been more simple or convenient than with Schwan’s home delivery. Schwan not only has delicious food delivered right to your door, but you can choose the time and date of your delivery. Simply go to Schwan’s home delivery website where you can choose from over 350 family favorites that have been flash frozen for freshness and flavor. Shopping is as easy as 1, 2, 3. First, browse through the wide selection of food and pick your meals. Second, place your order online, or for more convenience, order from the SCWHANS App on your mobile device. Third, select your time and delivery date. Why Does Schwan’s Home Delivery Choose to Freeze Food? Freezing food is the best way to lock nutrition, flavor and freshness into your foods. By freezing, the need for additives and preservatives is much lower. Fresh produce can be picked at the peak of ripeness and frozen at the optimal nutritional value. In addition, Schwan’s incredible selection of wild-caught seafood from clean, ice cold ocean waters is immediately flash-frozen. With the latest advances in freezing technology, there is practically no difference in taste and quality of fresh verses frozen foods. Schwan’s website even offers an informative video from Schwan’s Chef Collective that teaches about the benefits of cooking and serving vegetables that have been freshly picked and frozen within minutes. Check it out! What Are The Benefits of Eating Schwan? Schwan’s home delivery offers LiveSmart Foods . Choose from over 80 delicious foods that are made with low levels of fat, sodium and calories and zero grams trans fat. Gluten Free used to mean sacrificing great taste. Not anymore. Now you can find your favorite dishes made with delicious gluten free ingredients. No more paying outrageous prices for organic food, and having limited choices at your grocery store. Schwan offers Pure and simple organic foods that are all natural, with no additives or preservatives and always 100% Grade A.
Organically grown foods have more vitamins, minerals and enzymes than commercial foods because the soil is nourished by responsible standards. Levels of vitamin C are higher in organic vegetables and they provide more iron, magnesium and phosphorus. Many people say that organically-grown food just tastes better but another strong reason to eat organic is avoiding GMOs (genetically engineered food). There have been no long term studies on humans as to the effects GMOs will have on our bodies. Lastly, by eating organic meat, you can avoid harmful hormones, antibiotics and drugs that are often in the fatty tissue of commercial meat products. Check out the special offers and savings at Schwan’s home delivery. New customers can save 30% on their first order. Specials and Hot Deals allow you to save on multiple purchases. Schwan’s Chef Collective Schwan’s Chef Collective is a collaborative event that allows ordinary people to passionately create and enjoy food that your family or guests will love. Their recipes are chef-inspired, and the best part? These creations are easy to prepare and delicious. Check out the special section on their website that offers these amazing and simple to prepare meals. Try one out the next time you need a special meal for your family or guests. Their website even has a “How To” section that lets you learn to cook like a chef with easy tips from their culinary experts. With busy schedules, long shopping lines, difficulty finding quality food, Schwan’s home delivery is the answer to providing nutritious and delicious meals for your family. There is something to the saying, “You Are What You Eat”. Fast food, taking shortcuts on quality, will only result in weight gain and health problems. Schwan offers incredibly fresh and healthy options for those too busy to plan, shop for, and prepare quality meals. Order from your phone or their convenient website and have your fresh food delivered to your door. Your family deserves the best and that’s what Schwan offers. 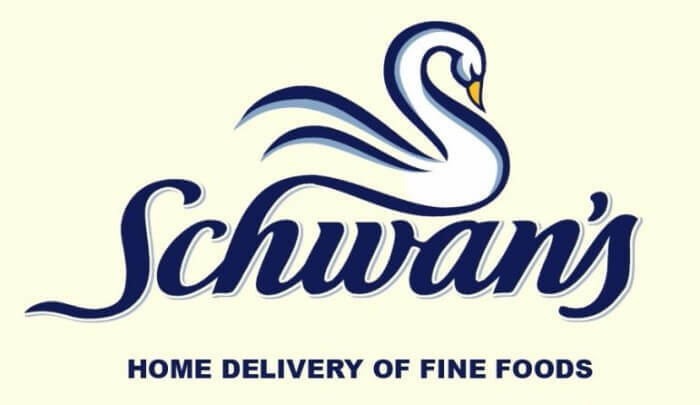 Schwan’s Rewards offers points worth 5% from every online purchase. You can enroll for free. Get free delivery on your online purchases of $49.99 or more. Schwan’s home delivery participates in AARP Program, Schwan’s Pay, Schwan Rewards and has its own Schwan’s Cares Fundraising program. Learn more in the “About Us” page where you can watch informative videos, read blog posts, and look through online catalogues. Hey Buddy!, I found this information for you: "Schwan’s Home Delivery 101: Areas, Hours, Fees". Here is the website link: https://all2door.com/schwans-home-delivery/. Thank you.